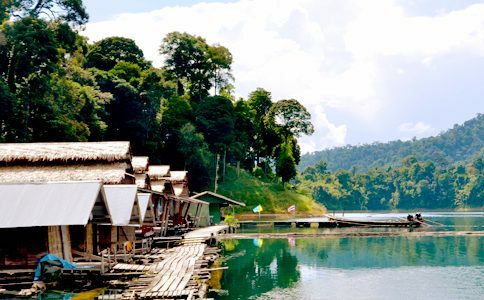 Klong Ka Raft House lies at the southernmost tip of Lake Cheow Lan. It features classic, farmhouse-style family bungalows (no longer available to the public), plus the traiditonal 2-person bamboo bungalows and a serene remote setting. 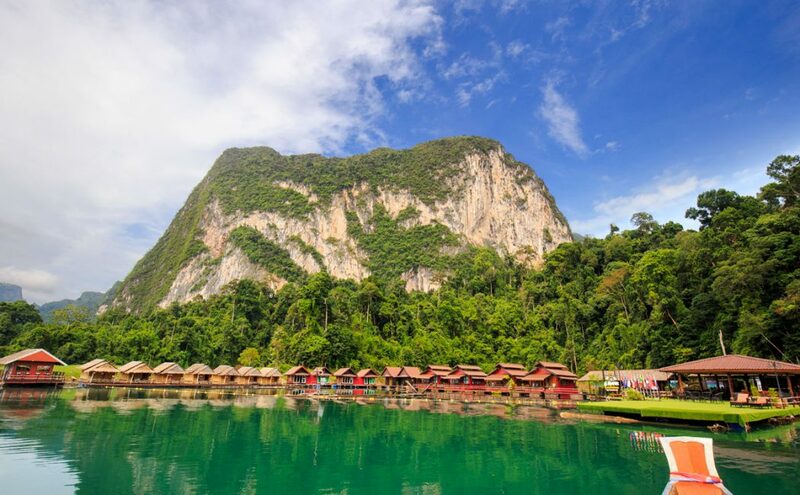 Local attractions include a hike to the Diamond Cave, access to fishing gear, and bamboo raft wildlife safari, and a hike through the jungle flatlands nearby. The main room type booked at this raft house is their bamboo bungalows are the standard bungalows similar to what you’d find at other bamboo raft houses: simple, but lovely! Rarely available are their modern style rooms, which have private bathrooms and can be requested in a modern comforts tour. 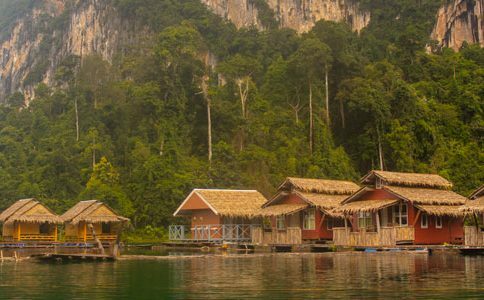 Klong Ka is one of the most popular, if not the most popular, raft houses on the lake and also has a 2 month advance booking limit. Getting rooms here is not always easy, especially in the high season! 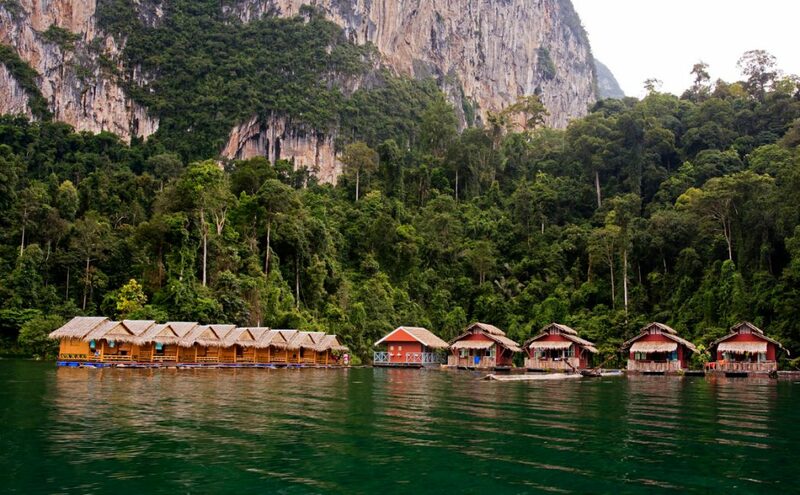 The smaller number of rooms and lovely scenery does make this place a favorite among Thai tourists, fishers, and nature lovers alike. 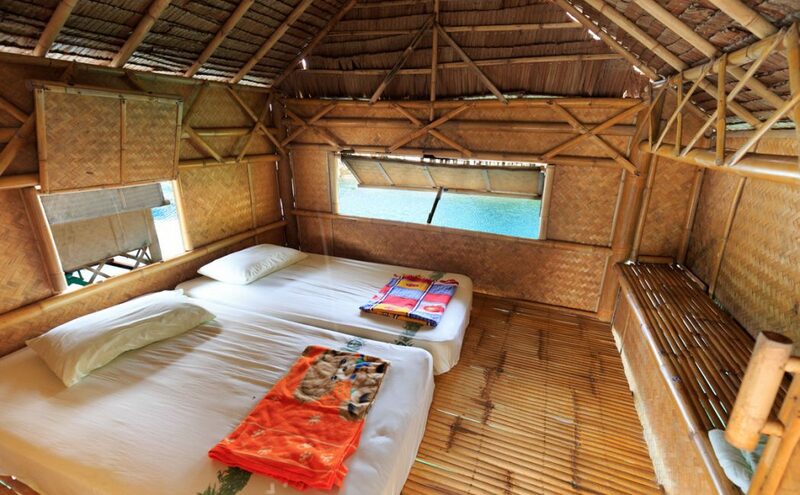 Though we occasionally use these bungalows for our group tours or bamboo bliss experiences, it is not often. If you’d like to book at Klong Ka, we are happy to check availability for a private custom tour to suit your needs. Klong Ka Raft House features classic, farmhouse-style family bungalows and a serene remote setting. Local attractions include a hike to the Diamond Cave, access to fishing gear, and bamboo raft wildlife safari.